Originator trastuzumab (Herceptin®; H) is an antibody-targeted therapy to treat patients with human epidermal growth factor receptor 2-positive (HER2+) early breast cancer (EBC). We investigated the overall survival (OS) advantage conferred by the addition of H to chemotherapy for HER2+ EBC patients and how the OS advantage changed over time. A systematic literature review (SLR) identified randomized controlled trials (RCTs) and non-randomized studies (NRSs) published from January 1, 1990 to January 19, 2017, comparing systemic therapies used in the neoadjuvant/adjuvant settings to treat HER2+ EBC patients. 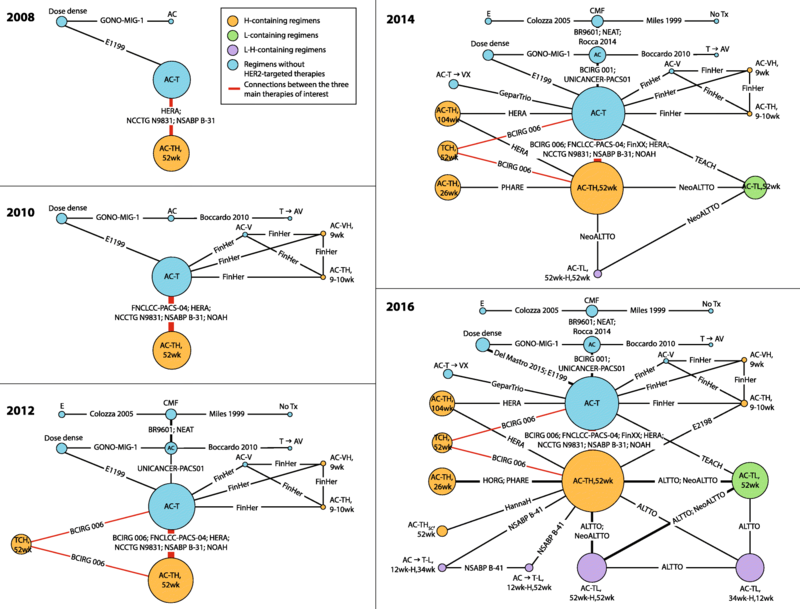 Bayesian cumulative network meta-analyses (cNMAs) of OS were conducted to assess the published literature over time. Heterogeneity was assessed through sensitivity and subgroup analyses. The SLR identified 31 unique studies (28 RCTs, 3 NRSs) included in the OS analyses from 2008 to 2016. In the reference case cNMA (RCTs alone), initial evidence demonstrated an OS advantage for H/chemotherapy compared with chemotherapy alone in HER2+ EBC patients. As additional OS data were published, the precision around this survival benefit strengthened over time. Both H/anthracycline-containing chemotherapy and H/non-anthracycline-containing chemotherapy regimens provided similar OS advantages for HER2+ EBC patients. This analysis represents the most comprehensive SLR/cNMA to date of published OS data in HER2+ EBC studies. These findings demonstrate why H/chemotherapy is now the established standard of care in HER2+ EBC. In the case of H, the benefits of early patient access far outweighed the risk of waiting for more precise information. Human epidermal growth factor receptor 2-positive (HER2+) breast cancer (BC) is an aggressive disease that makes up approximately 20% of all invasive BC [1, 2]. Early stage BC (EBC) describes disease that is detected in the breast and nearby lymph nodes but has not spread to distant areas of the body . Recommended treatment of EBC is a multi-step approach that often includes neoadjuvant therapy, surgery, and adjuvant therapy [4–6]. Therapy for HER2+ EBC should be based on a patient’s predicted sensitivity to treatments, underlying comorbidities, likelihood of benefit, and risk of relapse [4, 6]. The development of HER2-targeted therapies has revolutionized the treatment of HER2+ BC that was previously associated with high relapse and mortality rates. Current guidelines suggest that HER2+ EBC patients should receive chemotherapy and anti-HER2 agents, such as originator trastuzumab (Herceptin®; H) [4, 6, 7]. As an antibody-targeted therapy, H binds to the extracellular domain IV of HER2, thereby inhibiting downstream cell signaling implicated in cell proliferation, motility, adhesion, and survival . Initially approved by all major regulatory bodies for the treatment of HER2+ metastatic breast cancer (MBC) [9–12], approved use of H was expanded to HER2+ EBC in 2006 [13–15]. Clinical trials in HER2+ EBC and MBC have established that treatment with H/chemotherapy increases disease-free and overall survival (OS) compared with chemotherapy alone [16–20]. Concomitant administration of anthracyclines with H can produce cardiotoxic effects, so non-anthracycline-containing regimens may be beneficial for some patients [5, 21, 22]. A sequential regimen of anthracyclines and H/taxanes is appropriate for most patients [4, 5]. H for 1 year administered with an acceptable chemotherapy regimen is the recommended standard of care for EBC [4–6]. The efficacy of H for the treatment of HER2+ EBC has been demonstrated in phase II and phase III clinical trials; however, an assessment of the accumulation of publicly available evidence over time has not been made. 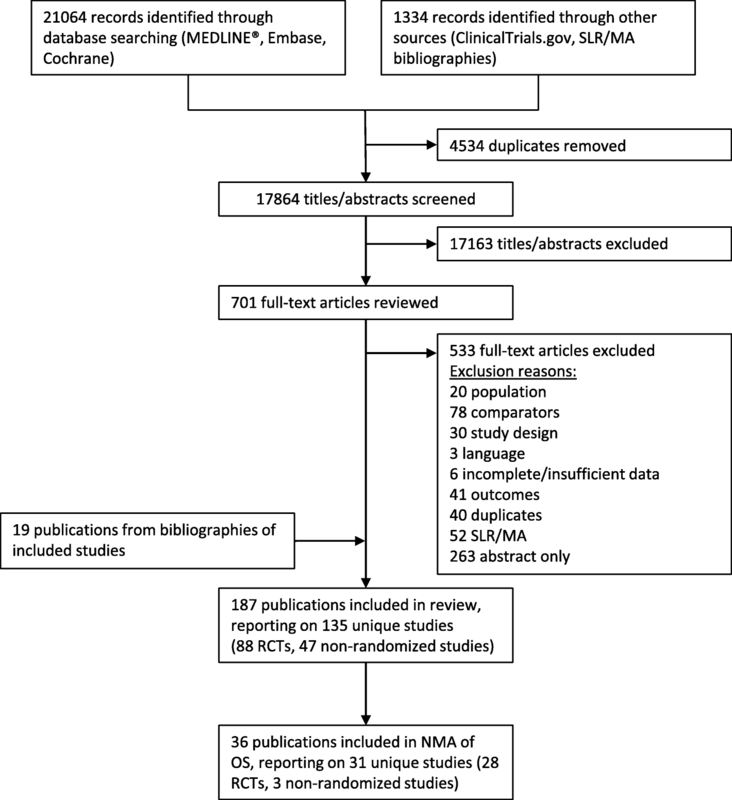 Here, we report the results of a systematic literature review (SLR) and cumulative network meta-analysis (cNMA) that evaluates the survival advantage conferred by the addition of H to chemotherapy regimens for the treatment of HER2+ EBC, and how the certainty of this survival advantage has changed over time. The SLR/NMA protocol is registered on PROSPERO (CRD42017055763), https://www.crd.york.ac.uk/PROSPERO, and has been described previously . Our SLR was conducted in accordance with PRISMA guidelines . A completed checklist is provided in the Additional file 1. Briefly, an SLR was conducted to identify randomized controlled trials (RCTs) and non-randomized studies (NRS) of systemic therapies used in the neoadjuvant/adjuvant settings to treat adults with HER2+ EBC, locally advanced BC, or inflammatory BC. Database searches were performed using a predefined, peer-reviewed search strategy, spanning from January 1, 1990 to January 19, 2017 (Additional file 1) . Studies were reviewed in duplicate based on prespecified eligibility criteria (Additional file 1) . Data were extracted from included studies based on prespecified categories. Hazard ratios (HRs) with 95% confidence intervals (CIs) were extracted for the outcomes of interest. OS was the primary outcome of interest and is the focus of our analyses . No adverse events or safety information were extracted as per protocol, other than the number of deaths. A risk of bias assessment of included studies was completed as described . Network meta-analysis is an approach that allows the simultaneous comparison of multiple treatments that may not have been compared directly in the same study [25–27]. A traditional NMA provides an assessment of all available evidence at a particular time point. To investigate how the evidence for H has changed over time, we performed a Bayesian cNMA based on well-established methods by the National Institute for Health and Care Excellence (NICE) [28, 29]. A cNMA is a series of NMAs sequenced chronologically based on the publication dates of studies, wherein each NMA incorporates additional studies over time. We evaluated the available evidence for the survival advantage conferred by H/chemotherapy regimens of interest over 2-year intervals from 2008 to 2016. We performed separate NMAs for each time interval so that each NMA included all publicly available evidence published from 1990 until that time point. The publication of newer trial results replaced the corresponding older results for the same trial. Evidence networks show each treatment as a node and comparisons between treatments are shown as lines linking the nodes. Node size reflects sample size and line width reflects the number of studies included in the connection. The networks expand as new evidence is added over time, and nodes and connections increase accordingly. We categorized studies based on the proportion of HER2+ patients, and only 100% HER2+ EBC patients were included in analyses. For studies that included < 100% HER2+ EBC patients, we extracted OS data from HER2+ subgroups when possible. Our reference case included all RCTs (100% HER2+ patients and HER2+ subgroups), and we conducted sensitivity analyses for (1) RCTs with 100% HER2+ patients, and (2) RCTs with 100% HER2+ patients, RCTs with HER2+ subgroups, and NRS. We focused on pairwise comparisons between the two most widely used H regimens and a reference treatment. The recommended treatment duration for H is 52 weeks [5, 6, 30], and the two most widely used and recommended regimens at this duration are AC-TH52 weeks (anthracycline/taxane-containing chemotherapy with H intravenous [IV]) and TCH52 weeks (non-anthracycline-containing chemotherapy with H IV) [4–7, 13, 15]. A standard chemotherapy regimen consisting of anthracycline/taxane-containing chemotherapy (AC-T) was selected as the reference treatment. Random effects (RE) models were performed as primary analyses with vague priors assigned to basic parameters throughout. For vague priors, we assumed a uniform distribution (i.e., uniform [0, 5]) for between-study variance, as recommended by NICE . Fixed-effect (FE) models were reported as sensitivity analyses. In accordance with NICE Technical Support Document methods, the log HR was treated as a continuous outcome and the final results were subsequently exponentiated [28, 29]. As a measure of the association between each treatment and its efficacy, Markov chain Monte Carlo methods were used to model HR point estimates and 95% credible intervals (CrIs) for each pairwise comparison. Estimates with 95% CrIs that excluded the null value of 1 were considered to reflect statistically significant differences between interventions. HRs < 1 corresponded to beneficial treatment effects of the first treatment compared with the second treatment. We generated values to show the probability of the first treatment being better than the second treatment within each pairwise comparison (p[better]) . To assess model fit, the posterior residual deviance from each NMA was compared to the corresponding number of unconstrained data points. Analyses were conducted using WinBUGS (version 1.4.3, MRC Biostatistics Unit, Cambridge, UK) and R (version 3.2.2, R Core Team, Vienna, Austria). Three chains were fitted in WinBUGS for each analysis, with a burn-in of at least 40,000 iterations and subsequent iterations of at least 40,000 (WinBUGS code is available upon request). Model convergence was assessed using trace plots, the Brooks-Gelman-Rubin statistic, and inspection of Monte Carlo errors . We attempted to conduct sensitivity analyses to combine RCTs and NRS. Including high-quality NRS can allow larger, diverse populations to be captured, and can allow the consideration of treatments that may not have been studied in RCTs; however, including low-quality NRS can introduce confounding bias if the baseline characteristics and risk factors in the treatment groups are substantially different [25, 32, 33]. We assessed the statistical methods of eligible NRS and only included the highest quality studies with appropriately adjusted effect estimates. We also assessed study and patient characteristics in all studies to ensure similarity and to investigate the impact of heterogeneity. A Bayesian hierarchical model that includes a study-design level is generally considered the most flexible for combining RCTs and NRS [34–37], but the structure of our evidence networks did not permit this analysis (Additional file 1). Instead, we performed a sensitivity analysis that naïvely combined RCTs and NRS. To assess the robustness of the reference case analysis, we also conducted a sensitivity analysis using whole survival curves rather than hazard ratios. We considered the following subgroup analyses: neoadjuvant versus adjuvant therapy, node-positive BC (N1–N3), node-negative BC (N0), hormone receptor-positive (HR+) BC, hormone receptor-negative (HR−) BC, large tumors (≥ 2 cm), and small tumors (< 2 cm). We investigated anthracycline-containing versus non-anthracycline-containing chemotherapy by focusing on the pairwise comparison of AC-TH52 weeks versus TCH52 weeks. Inconsistency in the evidence networks was assessed by comparing the posterior residual deviance and deviance information criterion (DIC) statistics in fitted consistency and inconsistency models . The posterior mean deviance of the individual data points in the inconsistency model was plotted against the corresponding posterior mean deviance in the consistency model to identify potential studies contributing to inconsistency (Additional file 1). Hoffmann-La Roche Ltd. funded this study. All authors had access to and the opportunity to review final study data, and are responsible for data interpretation and preparation of the report. All authors attest to study completeness, data accuracy, and data analysis, and all were responsible for the final decision to submit for publication. Figure 1 outlines the PRISMA diagram for the literature review. In total, 187 publications reporting on 135 unique studies met our inclusion criteria; however, only 36 publications reporting on 31 unique studies (28 RCTs and 3 NRS) reported OS and were included in our analyses (Table 1). Overall, the included studies had a low risk of bias (Additional file 1). Several RCTs allowed for crossover, but a lack of information prevented us from performing a sensitivity analysis (Additional file 1). Table 2 and the Additional file 1 summarize the 28 publications with OS results. Studies were conducted internationally, and median patient age ranged from 48 to 56 years. Approximately 15–100% of study patients were node-positive, 19–81% had HR+ tumors, and 45–100% had tumors ≥ 2 cm. Details of evidence networks and HRs used in analyses are available in the Additional file 1. Figure 2 shows the reference case cNMA evidence networks (interactive figure available online: https://goo.gl/ppkLrG). The final evidence network in 2016 includes 21 nodes connected by 28 RCTs (26 publications). Data from head-to-head trials were available for 31 pairwise comparisons in the network with single studies informing 24 comparisons. In total, 7341 patients (380 deaths) were included in the 2008 evidence network. By 2016, 33,029 patients (3929 deaths) were included. Based on results from the reference case cNMA RE model (Fig. 3), for the pairwise comparison of AC-TH52 weeks vs. AC-T, evidence in 2008 demonstrated an OS advantage for H/chemotherapy compared with chemotherapy alone (HR 0.66, 95% CrI 0.03–12.27). The corresponding probability of AC-TH52 weeks being better than AC-T in 2008 was 79% (standard deviation [SD] 41%). The certainty of this survival benefit strengthened over time, with an OS advantage for AC-TH52 weeks relative to AC-T in 2016 (HR 0.70, 0.62–0.82), and a p(better) value of 100% (SD 2%). For the pairwise comparison of TCH52 weeks vs. AC-T, no evidence was available for 2008 or 2010. Initial published data in 2012 demonstrated no significant difference in OS for H/chemotherapy compared with chemotherapy alone (HR 0.78, 95% CrI 0.20–3.07). Over time, the precision around the OS estimate improved, showing an OS advantage for H/chemotherapy compared with chemotherapy alone in 2016 (HR 0.77, 0.59–1.06). 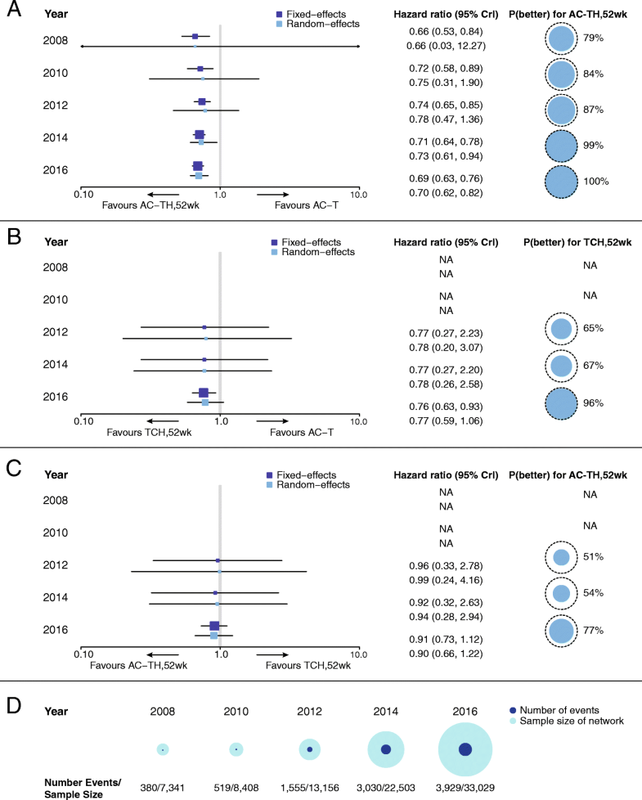 The probability of TCH52 weeks being better than AC-T in 2012 was 65% (SD 48%), and this increased to 96% (SD 21%) in 2016, due to the addition of studies to indirect comparisons. For the pairwise comparison of AC-TH52 weeks vs. TCH52 weeks, both H/chemotherapy regimens showed a similar OS advantage, and the precision around these effect estimates improved over time. The effect estimate in 2016 showed a slight advantage for AC-TH52 weeks compared with TCH52 weeks, (HR 0.90, 95% CrI 0.66–1.22; p[better] 77%, SD 42%). Model fit statistics were favorable for both the FE and RE models (Table 3). The FE model was preferred for earlier time points when the evidence networks were largely composed of single-study connections. The RE model was preferred for later time points when the network incorporated more multi-study connections, and the RE model heterogeneity was lowest in 2016. An assessment of inconsistency for the 2016 reference case analysis did not identify any concerns regarding inconsistency between direct and indirect evidence (Additional file 1). Cumulative NMA results from sensitivity analyses are provided in the Additional file 1. In sensitivity analysis #1 (only RCTs with 100% HER2+ patients), cNMA results showed an OS advantage for patients who received H/chemotherapy compared with chemotherapy alone, and the presence of anthracycline in the chemotherapy regimen did not significantly affect OS results. In sensitivity analysis #2 (naïve pooling of RCTs and NRS), cNMA results for the pairwise comparison of AC-TH52 weeks vs. AC-T aligned with the reference case results. For the pairwise comparison of TCH52 weeks vs. AC-T, initial evidence in 2012 demonstrated no significant difference in OS for H/chemotherapy compared with chemotherapy alone, but by 2016, there was a shift to an OS advantage for patients who received TCH52 weeks, and the precision around the estimate improved. For the pairwise comparison of AC-TH52 weeks vs. TCH52 weeks, initial evidence in 2012 suggested an OS advantage for AC-TH52 weeks (although not significant). The precision around the effect estimates for this comparison improved over time, with a shift towards both H/chemotherapy regimens showing a similar OS advantage in 2016. Results from the reference case cNMA were also supported by a sensitivity analysis using whole survival curves. We conducted subgroup analyses based on nodal status, HR status, and tumor size; a subgroup analysis of neoadjuvant versus adjuvant therapies was not feasible because of insufficient information (Additional file 1). Due to many single-study connections in the subgroup analyses, we have only presented results from the FE model (Fig. 4). Our results show that the addition of H to chemotherapy provides an OS advantage for all analyzed subgroups. For the node-negative and small tumors (< 2 cm) subgroups, a slightly greater OS advantage was provided by H/anthracycline-containing chemotherapy compared with H/non-anthracycline-containing chemotherapy (2016 HR 0.79, 95% CrI 0.30–2.08; 2016 HR 0.68, 0.37–1.23, respectively), although there was reduced precision in the effect estimates compared with the node-positive (2016 HR 0.89, 0.63–1.25) and large tumors (≥ 2 cm) (2016 HR 0.86, 0.62–1.19) subgroups, respectively. 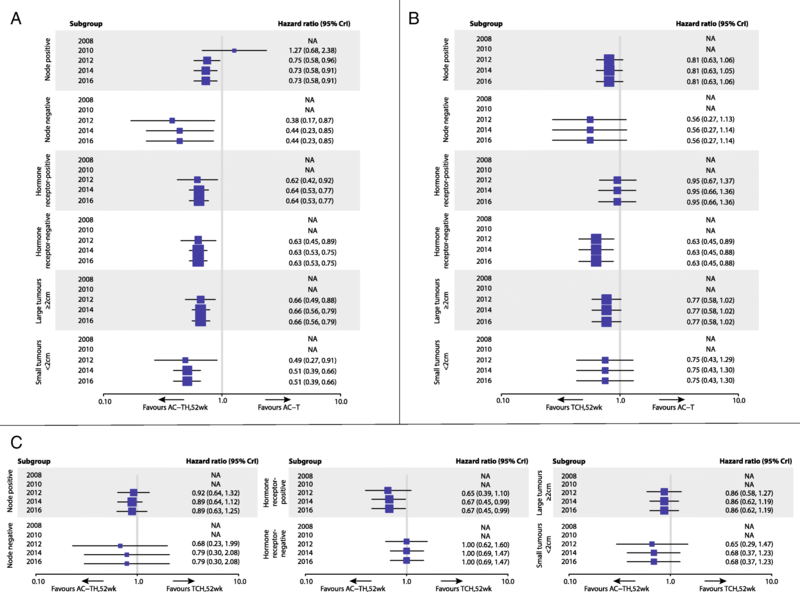 HR− patients showed similar OS effects from either an anthracycline- or non-anthracycline-containing regimen with H (2016 HR 1.00, 0.69–1.47), whereas HR+ patients received greater OS benefit from H/anthracycline-containing chemotherapy (2016 HR 0.67, 0.45–0.99). Our cNMA evaluated the OS advantage conferred by the addition of H to standard chemotherapy in HER2+ EBC, compared the two most widely used H/chemotherapy regimens, and assessed how the evidence evolved over time. Initial evidence from the reference case analysis consistently demonstrated an OS advantage for patients who received standard of care treatment with 52 weeks of H/chemotherapy compared with chemotherapy alone. Over time, the precision around the OS estimates improved and the certainty in the survival benefit strengthened. A comparison of H/anthracycline versus H/non-anthracycline-containing chemotherapy regimens showed that both regimens provided a similar OS advantage for HER2+ EBC patients, and the precision around the effect estimates for this comparison improved over time. Over 2.2 million HER2+ BC patients have been treated with H, including nearly 17,000 in the context of a clinical trial . This, combined with data presented herein, clearly support originator trastuzumab as the established standard of care in the HER2+ EBC setting. In addition, a survival benefit was seen for all analyzed patient subgroups who received 52 weeks of H/chemotherapy. Although H/chemotherapy demonstrated a survival benefit in all node-positive and node-negative subgroup analyses, the limited availability of published data for the node negative subgroup resulted in reduced precision of effect estimates. Node-positive disease is associated with higher risk of relapse , so more intensive regimens are commonly used to treat these patients [4, 40, 41], which may show a greater magnitude of effect. Few node-negative patients were included in the RCTs evaluated. Although the recent adjuvant paclitaxel and trastuzumab (APT) trial showed that an adjuvant H/paclitaxel regimen is beneficial to node-negative patients, and it is less toxic than a traditional adjuvant regimen, this trial was not included in our analyses due to its single-arm design and lack of OS data . Results from the HR subgroups showed that HR− patients received an OS benefit from H regardless of whether an anthracycline- or non-anthracycline-containing regimen was administered, whereas HR+ patients received OS benefit from an anthracycline-containing regimen with H. This difference may be due to coamplification of topoisomerase II alpha (TOP2A), which occurs in about a third of HER2+ cancers, and results in increased anthracycline sensitivity, longer progression-free survival, and improved OS [43–45]. HR− patients may experience more relapse events and deaths in the first 5 to 8 years of follow-up compared with HR+ patients [4, 46–49]. By 8 years of follow-up, the incidence of relapse is approximately equal in both subgroups. After 8 years, more relapse events were observed in the HR+ subgroup, which could be due to the overexpression of hormone receptors and activation of additional cell signaling pathways [4, 48, 49]. Increased anthracycline sensitivity in the HR+ subgroup could be contributing to the beneficial OS effect by targeting estrogen signaling pathways. HR+ patients are likely also receiving endocrine therapy, which may contribute to the lower relapse incidence observed at earlier stages in this subgroup. The broader use of mammographic screening and earlier diagnosis of EBC has resulted in an increased incidence of small tumors . Our cNMA subgroup results for patients with small tumors (< 2 cm) show a slightly greater OS advantage was provided by H/anthracycline-containing chemotherapy compared with H/non-anthracycline-containing chemotherapy. Precision improvement was only seen with H/anthracycline-containing chemotherapy, due to the addition of clinical evidence from the North Central Cancer Treatment Group (NCCTG) N9831 Intergroup trial and National Surgical Adjuvant Breast and Bowel Project (NSABP) B-31 joint analysis . Published data were only available for a tumor size threshold of 2 cm, but future work could investigate tumors of < 1 cm to confirm if H could also benefit these patients. The APT trial investigated patients with tumors ≤ 3 cm and suggested that an adjuvant H/paclitaxel regimen may be preferred for these patients; however, an H/anthracycline-containing comparator was not included . Conversely, results from our cNMA suggest that patients with tumors < 2 cm may benefit more from H/anthracycline-containing chemotherapy; however, only three trials were included in this analysis, so results should be interpreted with caution. In line with the APT trial, current guidelines recommend an adjuvant therapy of H/paclitaxel for small, HER2+, and node-negative tumors [7, 52]. In comparison, results from our cNMA subgroup analyses suggest that patients with small tumors (< 2 cm) and patients with node-negative tumors may benefit from an H/anthracycline-containing chemotherapy regimen compared with an H/non-anthracycline-containing chemotherapy regimen. This discrepancy shows the need for additional trials to investigate H/anthracycline-containing versus H/non-anthracycline-containing adjuvant therapies in this subpopulation. The cNMA subgroup results provide evidence for the differential use of anthracycline- versus non-anthracycline-containing regimens with H that may preferentially benefit certain subgroups. Although the HR+ subgroup appeared to show greater relative improvements in OS with anthracycline-containing regimens, the HR− subgroup showed a similar benefit with either chemotherapy regimen. Therefore, HR− patients could avoid the cardiotoxic effects caused by anthracyclines by choosing a non-anthracycline-containing regimen. Similarly, node-negative patients could avoid anthracycline cardiotoxicity, as H/non-anthracycline-containing chemotherapy appeared to be effective for this subgroup, although with reduced precision. These subgroup analyses align with a recent meta-analysis that demonstrated an OS benefit for HER2+ EBC patients with small (≤ 2 cm), HR+ or HR− tumors who received H with their treatment regimens . A potential limitation of our subgroup analyses is the heterogeneity caused by limited available data and small sample sizes. An imbalance in the weight of our subgroup results is due to an imbalance in the distribution of subgroups in studies. For instance, most RCTs in EBC were not designed solely for patients with node negative disease or small tumors . Therefore, although our results support current clinical practice, subgroup results should be interpreted with caution . Future studies should further assess these subgroups to help direct the neoadjuvant/adjuvant treatment approach. The presence of heterogeneity in the studies and the structure of the evidence networks limited our ability to adjust for various patient and study characteristics. However, we have accounted for heterogeneity and inconsistency using best practices that are consistent with those employed by HTA bodies such as NICE and CADTH [54–57]. A limited number of high-quality NRS were identified, which restricted the methods used to combine evidence from RCTs and NRS. However, this lack of NRS is not expected to alter findings; NRS are often associated with more favorable estimates than RCTs, so our estimates are likely conservative. The lack of NRS also likely improves the validity of our findings, because inclusion of such studies in an NMA often introduces bias [25, 32, 33]. Despite these limitations, the SLR underpinning the cNMA is the most up-to-date and comprehensive review currently available for the treatment of women with HER2+ EBC [58–62]. The SLR search spanned 26 years and identified over 17,800 unique records, demonstrating the vast amount of evidence available in this area of oncology. This study adheres to best practices for the conduct of NMA [54, 55] and to PRISMA reporting guidelines (Additional file 1) . Thorough sensitivity and subgroup analyses were conducted, adding strength and validity to the findings. Specifically, the inclusion of RCTs and NRS in a sensitivity analysis provided additional evidence to strengthen the comparisons. The results from the reference case cNMA were also supported by a sensitivity analysis using whole survival curves rather than HRs. The 11-year follow-up results from the HERA trial were published after the SLR end date (January 19, 2017) , and therefore were not identified by our search. Our current analyses include OS results from the 8-year median follow-up . The 11-year OS results show a similar, yet slightly stronger advantage for treatment with 52 weeks of H compared with observation, which is in alignment with our findings. The OS results for HR+ and HR− subgroups at 11 years  also align with our subgroup results. Results from the phase III APHINITY trial were also recently published . This trial investigates whether the addition of pertuzumab (Perjeta®) to adjuvant H/chemotherapy improves patient outcomes compared with H/chemotherapy alone. At a 45·4-month median follow-up, HER2+ EBC patients receiving dual HER2-targeted therapy showed a reduced risk of BC recurrence or death compared with patients receiving H/chemotherapy alone, and this effect was most detectable among higher-risk patients with node-positive or HR− disease . It would be worthwhile to incorporate data from these recent trials into a future cNMA. The improved precision in OS estimates that we see for regimens including H may be due, in part, to the establishment of H as standard of care therapy for HER2+ EBC patients, thus reinforcing the probability of H/chemotherapy being better than chemotherapy alone. Advances in earlier diagnosis and better disease management are likely also contributing to improved efficacy. The current SLR/cNMA represents the most comprehensive study to date of treatments for HER2+ EBC. It is uncommon to review the totality of a product’s clinical evidence at various time points and particularly over a prolonged timeframe. Initial evidence demonstrated an OS advantage for H/chemotherapy compared with chemotherapy alone in HER2+ EBC patients. The certainty of this survival benefit strengthened over time, as evidenced by the cNMA results. These findings demonstrate why H/chemotherapy is the established standard of care in HER2+ EBC, and support the decision to allow early patient access to H, as the benefits of treatment far outweigh the risk of waiting for more precise information to be published. Building on this legacy, H, as a subcutaneous injection, continues to provide strong benefits to these patients. Human epidermal growth factor receptor 2-positive. This study was sponsored by Hoffmann-La Roche Limited. All analyses were run independently by Cornerstone Research Group Inc., and industry collaborators did not impact the final results. The authors would like to acknowledge Aaron Situ for helping with statistical analyses and R programming, as well as Melissa Thompson, Dana Anger, Daniel Grima, and Joshua Gauci for providing constructive feedback. This study was sponsored by Hoffmann-La Roche Limited. FRW, MEC, MY, QW, CC, BS, and CB contributed to the study concept and design. BS performed the database searches. FRW, QW, and RD screened the studies and extracted the data. FRW and AV performed the statistical analyses. FRW, MEC, MY, CB, RD, AV, BH, and CC reviewed the results and interpreted the data. FRW prepared figures and wrote the first draft of the manuscript. All authors approved the final version of the manuscript. Not applicable; this analysis is based on published aggregate data and does not require ethical approval or informed consent. MEC and MY are current and past employees of Hoffmann-La Roche Ltd., respectively. FRW, QW, RD, AV, and CC are employees of Cornerstone Research Group Inc., who were paid contractors to Roche in the development of this manuscript. CC is also a shareholder in Cornerstone Research Group Inc. BH provides methodological advice for Cornerstone Research Group Inc. CB was a clinical advisor for the project. BS is a paid librarian contractor to Cornerstone. Cornerstone Research Group Inc. consults for various pharmaceutical, medical device, and biotech companies. This research was performed under a research contract between Cornerstone Research Group Inc. and Hoffmann-La Roche Ltd. and was funded by Hoffmann-La Roche Ltd.
HER2 testing for breast cancer. http://www.cancer.net/research-and-advocacy/asco-care-and-treatment-recommendations-patients/her2-testing-breast-cancer. Accessed July 17, 2017. Stages of breast cancer. http://www.breastcancer.org/symptoms/diagnosis/staging. Accessed July 17, 2017. European Medicines Agency. Herceptin (trastuzumab): authorization details. http://www.ema.europa.eu/ema/index.jsp?curl=pages/medicines/human/medicines/000278/human_med_000818.jsp&mid=WC0b01ac058001d124 Accessed Sept 25, 2017. National Comprehensive Cancer Network. NCCN guidelines for patients: breast cancer early-stage. https://www.nccn.org/professionals/physician_gls/f_guidelines.asp. Accessed Feb 21, 2017.